Aeroplan has launched a great new bonus for your online shopping! 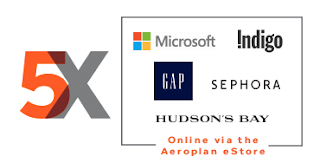 If you funnel your purchases through the Aeroplan eStore until April 16th you'll earn no less than 5x the regular miles normally awarded for each purchase. Of course if you hold Aeroplan status you'll earn more, Silver & Black members will each get 6x the miles while Diamond members get 7x miles. Of course you have to ensure you triple dip on your purchases by using a points earning credit card for them such as the TD Aeroplan Visa Infinite Card to boost your Aeroplan miles but then we would recommend using a card like the Chase Marriott Rewards Premier Visa card for those retailers charging in USD since the card has no foreign transaction fee. Whether shopping for yourself or someone else (Mother's day is only a month away!) don't wait to get it done, you might as well do it now to score lots more miles! Visit the Aeroplan eStore today to take advantage of this offer!